One New Aftermarket Replacement Cylinder Head (with Seats and Valve Guides) that fits John Deere Tractor Models: M, MT, MC, 40, 320 & 330. The valve seats must be final machined and the guides must be reamed to fit the valve stems. Does not include valves, springs or studs. Replaces Part Number: AM239T, Casting Numbers M56T, M1768T. Our processing system is automated. Thank you for your continued patronage. We carry parts for Engines, Transmissions, Front & Rear Axles, Hitch & Drawbars, Undercarriages, Final Drives, Seats, Bearings, Cups, Cones, Seals, Discs, Couplers, Gears, Brakes, Pressure Plates, Pilot & Throw Out Bearings, Ring & Pinions, Gaskets, Decals and MORE for most high wear items. We also carry replacement parts for the Boom Cylinder (Seal Kits, Tubes, Glands, Pistons, Rods). 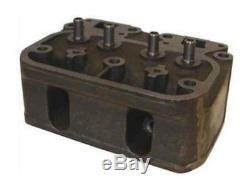 The item "New Cylinder Head with Seats & Valve Guides for John Deere M MT M 40 320 330" is in sale since Wednesday, June 22, 2011. This item is in the category "Business & Industrial\Heavy Equipment Parts & Accs\Antique & Vintage Equip Parts".